In 2016, the Centennial Year of the National Park Service (although National Parks had existed for decades prior), Sean and I embarked on a mini-journey to calibrate our Park trips so that by the end of the year, we’d both have visited the same National Parks. That meant that we had to travel to Yosemite, Shenandoah, Dry Tortugas, and Grand Canyon. Along the way, we picked up other Parks near those four so that by the end of the year, we’d visited eight National Parks and thirteen National Park units. After Yosemite and Channel Islands in May and Shenandoah in June (and Muir Woods, Golden Gate, and Point Reyes in August), we planned to visit the Grand Canyon in September. We knew that we’d want to pick up at least one more Park on a visit to the Grand Canyon. Very early in our planning, we considered a relatively short trip to the South Rim and Petrified Forest National Park, which is near the top of Sean’s list of Parks to visit. But we decided that an extended long weekend was giving both those Parks short shrift. So we refocused our attention on going to the North Rim and also Zion National Park and Bryce Canyon National Park. The North Rim was attractive to me because I’d been to the South Rim as a thirteen-year-old, and since then there’d always been an allure to the far-more-remote North Rim. Flights from Chicago to Las Vegas were looking inexpensive for September, so we began to solidify our plans, ultimately deciding on a ten-day trip to three Parks modeled on our September trip to the Dakotas two years earlier. Although unlike that trip, there would be no interlude of staying in a lodge or cabin. After the first night at a hotel near the airport, it would be nine nights of camping, our longest ever unbroken stretch. In addition to the three Parks, we’d also visit Cedar Breaks National Monument at the strong recommendation of our friend Aimee. The plan was to fly into Vegas and descend the Grand Staircase from Bryce Canyon to Zion to the North Rim, and possibly visit the South Rim on the way back to Vegas. The Grand Staircase refers to the series of plateaus and cliffs that comprise the southern portion of the Colorado Plateau in southern Utah and northern Arizona. 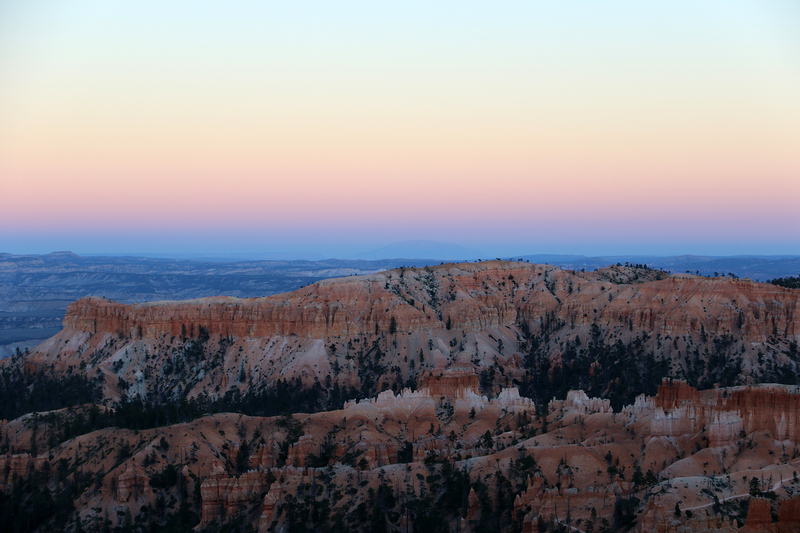 At each of the cliffs, the elevation drops (from 10,000 feet at Cedar Breaks to 2,200 feet at the bottom of the Grand Canyon) and a deeper level of geologic time is revealed. We were planning early enough (in March) that I was able to anticipate campsites becoming available on Recreation.gov. Staggered over a couple days as the campgrounds opened up reservations for the autumn, I nabbed a site in Sunset Campground at Bryce Canyon, an amazing site with an unobstructed view of the Watchman at Watchman Campground in Zion, and a site right on the rim of the Transept at the North Rim of the Grand Canyon. Then we turned around to book our flights, and the flights to Vegas had risen by a couple hundred dollars. Meanwhile, the flights to Phoenix were crazy cheap. So, we waited to see if they would flip back…and waited…and waited. But they never did. When the flights to Phoenix began to rise a touch, we pulled the trigger and booked them. So instead of flying in and out of Las Vegas, we would fly in and out of Phoenix. It meant a much longer drive from the airport to the parks and back again, but so be it. This entry was posted in Journey and tagged Arizona, Bryce Canyon, Grand Canyon, Grand Staircase, Utah, Zion on March 31, 2017 by Brandon Hayes.